Another hair product for you curlies and I've been so quiet about it on my social media to not spoil anything about it.I got these sent to me from Becoming MAYA a few weeks ago and have been using them since to see how well they work on my hair. As you know I've been using Cantu Curl Activator and John Frieda Curl Reviver for a long time now, and didn't find anything that was close enough to beat either of them. The first thing I noticed even before taking them out of the packaging was the scent.It smells absolutely gorgeous, and I didn't find it too overpowering despite being able to smell it before taking them out of the box.The second thing that I noticed which I really really love is the quality.Most brands lack in the "quality"field when it comes to designing a bottle that not only has a pump and a reasonable amount of product, but something that also looks like it was worth the money you paid for, and this ticks those boxes.And lastly the main thing everyone really wants to know, does it work? This crème has been developed for all curl types, and with my hair having a mixture of 3a/3b/3c curls, I wanted to see if it really could tackle them.Following the instructions on the bottle,I applied a reasonable sized amount(1p size) applying it to my damp hair root to tip. Taking my wet brush/afro pick I combed it through gently, making sure it was distributed evenly, and left my hair to air dry.My hair tends to frizz instantly when combing/brushing, even after adding a curl crème, but this stuff worked the opposite. 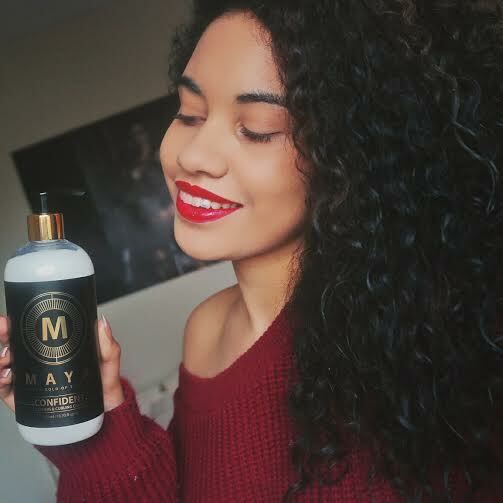 This is the result of my hair after 100% air dried and also after 3hours since applying it to my hair.My curls are defined, frizz free, moisturised and that smile is 100% genuine too because I was so happy with the results, I couldn't resist taking a photo of my hair alongside the product also.Another positive that I would like to add, is that I tried a smaller amount on my mums hair, which is fine, 2a/2b hair.I took a pea sized amount, as this crème is fairly thick, not wanting it to weigh her hair down.Taking about 3 strands, I applied it the same way as I did with my hair, using a small comb to distribute it, and the results worked great on her hair too!Me being stupid at the time, didn't get a photo, but next time I will try grab a photo, as she's not to keen having her photo taken. Its been a while since I wrote this post and wanted to update you on how well this product is doing a few months later.Firstly I'd like to mention that this product is no longer called "Feeling MAYA", it is now "Becoming MAYA".All the goodness is still packed up all in this bottle which I will provide below for you.So since I last posted on here, I've dyed my hair and now going through winter weather, which tends to make my hair more dry and frizzy. This product still works wonders on my hair, leaving it moisturised and no frizz in this cold weather.I also use it on days that I stay indoors, but want to keep my curls still moisturised, because lets be honest no one likes having that dry feeling to their hair.Would I still recommend this?The answer is hell yes, as its great for any curl type, and is essential to have this winter.